There’s a lot to hate about Dwarf Fortress. The ASCII graphics, the learning curve, the lack of a definite goal. It’s a game that doesn’t welcome newcomers. It’s a challenge to learn the controls, to survive; it’s even a challenge to understand what’s going on. But for every difficulty you overcome, you’re rewarded with something rich and worthwhile. You begin Dwarf Fortress by generating a world. Once the world is created, it begins its history. Forests grow, rivers wear down mountains, and civilisations are created and destroyed. The first thing to do is to find a location to start your fortress. Ideally somewhere with plenty of trees and water, and without evil creatures that love to kill dwarves. Once you’ve chosen your starting location, you’ll begin with a group of dwarves and a wagon. It is your job to turn this meager band of travelers into a thriving dwarf fortress. You do this by issuing commands to your dwarves (though they might not always listen). You’ll need to begin by carving your way into your surroundings and setting up a small home. From here it’s really up to you. The beauty of Dwarf Fortress lies in the freedom it gives you to do whatever you want. This game is, at its core, a simulator. It’s a game which simulates a world inhabited by dwarves, elves, and other creatures. Everything about the world is simulated, from the epic history of its civilisations to the wants and needs of the individual creatures which inhabit it. The scope of this game is far too much for any screenshot, review, or let’s play to cover. It’s too much for several hours of playing to cover. There really is no end to the things you can do, and the fun lies in creating worlds and societies over and over again. The phrase “Losing is Fun” is built into the game, and players have to accept that every fortress will fall. How and when this happens comes down to how you play, and the events that happen in the world. You’re often at the mercy of cruel forces bent on your destruction. You’ll need to fight off goblin raids, titans, and megabeasts. You’ll also need to keep your dwarves from going insane and killing each other. All of this makes for a game which is always new, exciting, and difficult. 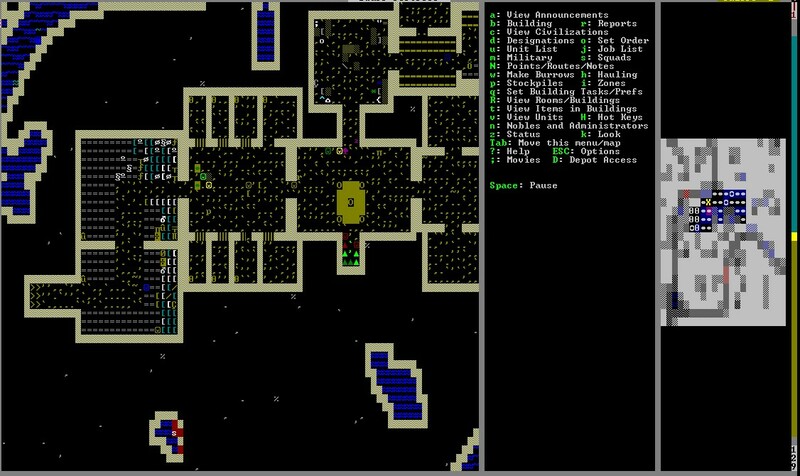 Dwarf Fortress has a dedicated cult following, but many players feel that the game’s progression is held back by its primitive graphics, interface, and control system. The amount of time that needs to be invested in order to play the game properly can be off putting. But for those that enjoy the game, the difficulty and learning curve are necessary parts of a game that’s as complex as Dwarf Fortress. If you’re willing to commit some time to it, this game can be hugely rewarding. TL:DR: Dwarf Fortress is a game which simulates a civilisation of dwarves. You need to find food, water, and alcohol to keep your dwarves alive and working. You can mine, construct traps, build furniture and form a militia as you expand your fortress. Download Dwarf Fortress here, and for new players I’d highly recommend this tutorial and the Lazy Newb Pack.